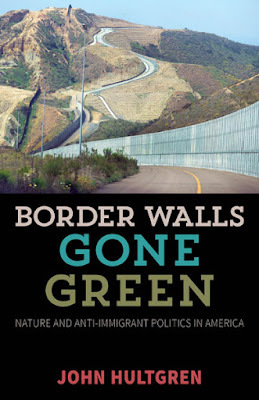 Hultgren, a political scientist, suggests the “central thesis” of the book is that “nature is increasingly being deployed as a form of walling—providing a subtle means of reinforcing ‘territorial’ borders without having to revert to racial and cultural logics that are no longer socially acceptable within mainstream political discourse” (pp. 1–2). That is a meritorious thesis to pursue in this study and one that Hultgren works to prove by the end of the book. “Nature, in this sense,” he posits, “provides a way for immigration restrictionists to expand their alliances beyond the far right while still maintaining the support of nativists,” a scenario that he argues is hardly new with “American greens” (p. 2). For theoretical background he provides some historical context from the anti-immigration stances of members of Earth First!, the Sierra Club, and a variety of environmentalist writers and activists. Thus he unpacks the connections between the “nature” of restrictionists and “narratives of political community” in this “emerging form of territorialization.” In other words, his goal is to shed “light on the discursive and institutional pathways through which nature is subtly woven into exclusionary political projects” (p. 3). In a larger sense, Hultgren’s point is to draw attention to “the complexities of natural-cultural interconnection,” especially how the environmental movement has been guilty of using “nature’s perceived location within progressive politics … to be used for exclusionary purposes by a variety of actors who seek to naturalize their (usually privileged) location within the political community while marginalizing others” (p. 5). For more on this issue, see here and here.